After stating yesterday that I agreed with Cathy that over 3/4 of the population would be banking online, I thought the least I could do is back that up with some stats. I believe in demographics, and that it often explains things in a way that’s almost fateful. Aging is one thing we can’t change. This is based on Canadian stats. 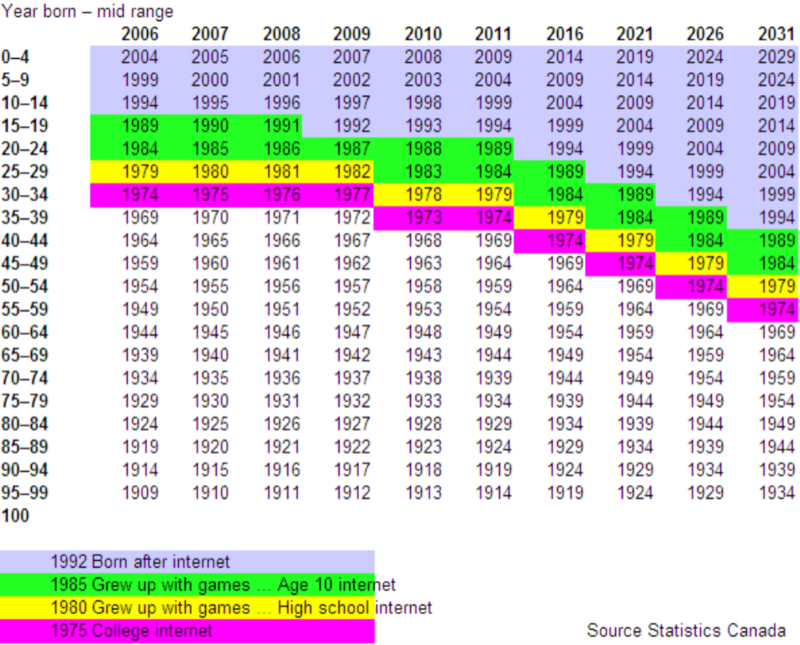 For each age band, I took the middle of the band and plotted the year those people were born. This tells us that by 2011, people up to age 40 have at a minimum known internet since at least college age, or earlier. A/B is the percentage that the net generation comprise of the working population. Around 2011 net gen comprise almost half the working population. By 2016 its a clear majority at 54%. Now go back to 2007. In 2007 we are 40% + banking online. Yet only 33% of the working population are net generation. 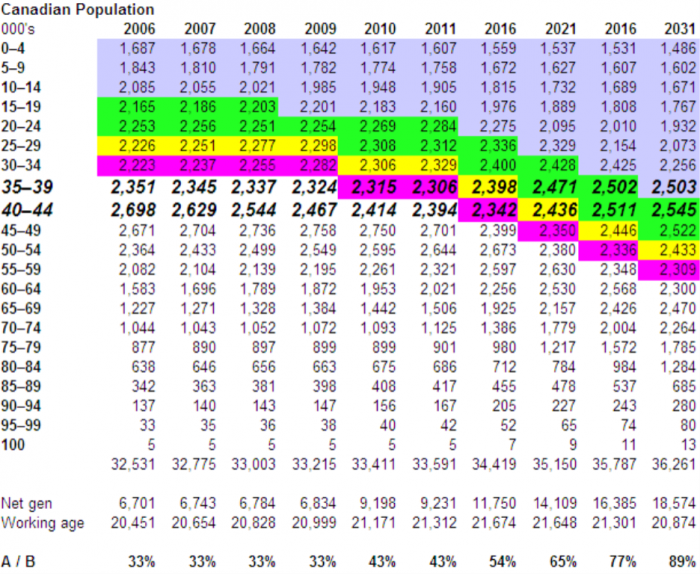 By 2011, this net generation will have grown by another half …. so making 76% banking online is probably a conservative estimate for Canada. Small note .. by 2031, 90% of the working population are internet generation. What is the impact of that shift, and the expectation that brings … and thats only 24 years away. The impact of demographic shift is easy to disregard, because it requires seeing the world through the paradigm of others, who are younger. This analysis suggests to me that we underestimate the impact of the net generation on use of internet, and expectations for companies, including Banks to deploy internet capabilities in the way they expect. One of the interesting paradox’s on online banking is that a lot of the non-webbanking users are in fact young people. Historically, the main reason people adopt online banking is if you have bills to pay. Many young people, right up to and through college have no/few bills to pay. Good point Tom .. in fact at that stage they are heavy users of ATM’s. So perhaps it depends on who pays the cell bill! I started the “working age” at 20, but perhaps should have shortened it to 24. Nonetheless, still a healthy majority of the working age folks will be internet generation people. It should also be noted while the internet generation is growing banks are spending more & resources on the brick & mortar. TD-CT has extended their branch hours and BMO has been opening massive multi-million one-stop branches. The massive investment loses have banks noe retrenching and refocusing on their bread & butter, the retail banking segment.